Experimental colitis with features similar to inflammatory bowel disease (IBD) has initially been described. A detailed analysis of inflammatory cells has not yet been described. Therefore in this study we characterized the cells involved in the acute phase of the colitis and compared those findings to what is known about human IBD. Colitis was induced in BALB/C and C57Bl6 mice by ingestion of 2.5% and 5% DSS in the drinking water for 8 days. Cells were labelled by immunohistochemical staining with F4/80 and ER-MP20 for macrophages, TIB 120 for MHC Class II presentation, and anti-CD4 and anti-CD8 antibodies. They were enumerated by using a novel method that employs video image analysis. Immunoglobulin-producing cells were enumerated by immunofluorescent staining for IgA, IgG and IgM and counting by using confocal microscopy. Inflammatory infiltrate in the acute phase of the dextran sulphate sodium (DSS) -induced colitis consists predominantly of macrophages, neutrophils and eosinophils. Neutrophils increase in numbers and crypt abscesses were also seen. Increased macrophage numbers were due to recently recruited monocytes from the peripheral circulation. It does not appear that there are any changes in T cell numbers or distribution. The inflammation induced changes in immunoglobulin-producing cells with IgA-producing cells affected the most. The effect on Ig-producing cells depends on the percentage of DSS used to induce colitis. In general, 2.5% DSS induces an increase and 5% DSS a depletion of these cells. In healthy colonic tissues, human intestinal macrophages can be found in the mucosa next to the basal membrane of the epithelial layer . In IBD, total numbers of macrophages are increased and subpopulations of macrophages, not normally present in the lamina propria of the intestine, appear [2, 3] indicating ongoing recruitment to the inflamed bowel [4, 5]. Bearing in mind their function, macrophages may contribute to intestinal damage by releasing oxyradicals  and by secreting proinflammatory cytokines and other inflammatory mediators, by phagocytosing foreign antigens or invasive micro-organisms or by acting as antigen-presenting cells. Regarding T cells, total numbers of T cells are increased in tissue samples  while the ratio of CD4+ to CD8+ cells is unchanged in patients with ulcerative colitis and decreased in patients with Crohn's disease due to an increase in numbers of CD8+ cells . One of the main histological findings in ulcerative colitis is the greatly increased number of plasma cells. It appears that B cells are undergoing proliferation and isotype switching as increased levels of IgG-bearing lymphocytes have been found in the mucosal lesion of ulcerative colitis . Isolated mononuclear cells from ulcerative colitis lesions secrete more IgG , an increase mainly due to the secretion of IgG1. On the other hand IgG2 secretion was increased from cells isolated from Crohn's disease patients [11, 12]. These findings were confirmed by Gryboski  when studying serum immunoglobulin classes in children with ulcerative colitis and Crohn's disease. Levels of IgA are decreased in chronic ulcerative colitis , severe ulcerative colitis and Crohn's disease, but not as much in less active IBD  and are increased in quiescent disease . Experimental colitis, similar to IBD and induced with ingestion of DSS was initially described by Okayasu et al. . Our findings confirmed that the lesion consists of inflammatory infiltration and consecutive multiple mucosal ulcers . The lesion was characterized by an inflammatory infiltration with monocytic cells, neutrophils and eosinophils as assessed by histopathological examination of the involved tissue. In this study, we characterized the inflammatory cells involved in the early response to DSS and compared these findings with the findings in human IBD. Mice were sacrificed at 3, 6 and 8 days of exposure to either 2.5% or 5% DSS, the colons were removed and fixed in periodate-lysine-paraformaldehyde (PLP) for 3 hours. Tissue was then transferred to 20% sucrose for 3–4 h and to 7% sucrose prior to embedding. PLP-fixed tissues were embedded in OCT compound (Miles Inc. Diagnostic Division, Elkhart, USA). Serial transverse, 6μ thick sections of the colon were washed in phosphate-buffered saline (PBS) for 5 min twice to remove OCT. Non-specific Fc binding was blocked by incubating with goat anti-mouse IgG (H+L) (Caltag Immunodiagnostics, San Francisco, CA, USA) 100 μl/10 ml PBS and 2% sheep serum for 30 min. The monoclonal antibodies F4/80 (used as supernatant, 1:3 in PBS) and ER-MP 20 (BMA, Rheinstrasse, Switzerland) (1:200) were used to show macrophage infiltration and activation during the process of inflammation. TIB 120 (used as supernatant, neat) was used to assess MHC class II expressing cells. Anti-CD4 (Pharmingen, San Diego, CA, USA) and anti-CD8 antibodies (Pharmingen, San Diego, CA, USA) (1:100) were used to show T cell infiltration as primary antibodies and applied after the blocking step. Omission of the primary or secondary antibody or appropriate isotype controls (unrelated antibodies of IgA isotype and IgG2b isotype standard, Pharmingen, San Diego, CA, USA) was used as negative controls. Spleen sections were used as positive controls. Following 60 min incubation at room temperature, slides were rinsed in PBS for 5 min twice, dehydrated in ethanol and endogenous peroxidase activity was blocked using 0.1% hydrogen peroxide in methanol for 10 min. Slides were rehydrated in ethanol, washed for 5 min twice in PBS then biotinylated sheep anti-rat antibody (Amersham International, Buckinghamshire, UK) (1:200 in PBS) was applied as a secondary antibody for 30 min followed by washing for 5 min twice in PBS. The avidin-biotinylated horseradish peroxidase complex (ABC kit, Vectastain, Vector Laboratories, Inc., Burlingame, CA, USA) was used to detect the relevant antigen by incubating with ABC for 30 min followed by washing in PBS for 5 min twice. Di-aminobenzidine (Sigma Chemical CO, St Louis, USA) (DAB, 1:5 in PBS) combined with 1 ml imidazole (10 mM) and 15 μll 30% hydrogen peroxide was used as a substrate and was applied for 10 min. Tissue sections were washed in water for 3 min, counterstained using Mayer's haematoxylin and mounted using Histoclad (Clay Adams, Parsippany, NJ, USA). Only the lamina propria was marked and its surface area measured. Crypts and epithelial cells were not included in this calculation. The results of the area measurement were corrected for the magnification of the microscope and the screen by dividing them by 1177. The number of positive cells was counted on the whole transverse section, within the area marked and expressed as positive cells per mm2 lamina propria. Peritoneal macrophages were isolated by injecting 10 ml PBS supplemented with 10 U heparin into the peritoneal cavity, massaging for several minutes and carefully withdrawing the fluid. The solution was centrifuged for 5 min at 1500 g, the supernatant was removed and the cell pellet resuspended in RPMI medium for cell culture containing 10% heat inactivated fetal calf serum, 50 U/ml penicillin, 4 mM glutamine 200 mM and 50 mg/ml gentamycin. The procedure was repeated three times. The number of cells in the fluid was counted on a haemocytometer and the final concentration was adjusted to 2 × 105 cells/ml, and then cultured in chamber slides in RPMI medium. After 24 h the medium was replaced by 5% DSS solution in RPMI or RPMI alone. Cells were incubated for 24 h in 5%CO2:95% air at 37°C. The supernatant was removed and cells were stained using toluidine blue for 10 sec, washed with distilled water and the slides covered using aqueous mounting medium. Slides were also stained with anti-DSS antibody  (MAb 5B10, Raymond Purves Bone & Joint Research laboratory, St. Leonards, NSW, Australia) using the avidin-biotin staining technique. Omission of primary antibody was used as negative control. Mab 5B10 has previously been shown to recognize 2,3-, 2,6-, and 4,6-disulphate ester ring substitution in pyranose-containing polysaccharides and to bind among others, dextran sulphate without having significant cross-reactivity with commonly occurring sulphated polysaccharides . In addition to what was known and prior to the immunostaining, we performed ELISA with our dextran sulphate to ensure that the antibody binds to our brand as well. Activated polyvinyl chloride immuno-assay plates (Dynatech, Alexandria, USA) were coated with 100 μl/well of a 50 μg/ml aqueous solution of poly-L-lysine (SigmaChemical CO, St Louis, USA) for one hour at 37°C and air-dried. DSS solution in PBS (50 μg/ml, pH 7.4) was added to each well and the plates incubated for one hour at 37°C. Followed by three washes in PBS-Tween 20 (polyoxyethylene-sorbitan monolaurate, Sigma, 0.05%v/v), 1% BSA-PBS was added and the plates incubated for one hour at 37°C, then after 5 washes in PBS-Tween 20 air dried and stored at 4°C until use. The antibody 5B10 (100 μl dissolved in 20 ml PBS-Tween) was added to the precoated wells and incubated for 90 min at 37°C. After three washes with PBS-Tween 20 buffer, 100 μl of sheep anti-mouse antibody conjugated with horseradish peroxidase (1:10 000, Amersham International, Buckinghamshire, UK) was added and the wells incubated at 4°C overnight. After three washes in PBS-Tween 20 buffer, 100 μl of OPD substrate (1 tablet of Calcibiochem o-Dihydrochloride dissolved in 5 ml citrate buffer and filtered through a 0.2 μm filter and with 2 μl H2O2) was added to the wells. The reaction was stopped with 50 μl 3 M H2SO4 and the optical density read on a Dynatech plate reader 5/3 (660/490 nm). Plasma cell infiltration in the intestine was examined by staining with methyl green pyronine; immunofluorescent staining for specific immunoglobulin-containing cells was used to assess the presence of different immunoglobulins and any changes in the course of the colitis. The specimens were fixed using cold ethanol , embedded in paraffin and 5μ sections cut on to gelatin-coated slides. Immunoglobulin-containing cells were detected by immunofluorescence as previously described . Briefly, tissues were dewaxed, rehydrated and then incubated with goat anti-mouse IgA (α-chain specific) (SeraLab, Crawley Down, Sussex, UK), followed by tetramethylrhodamine-isothiocyanate (TRITC)-conjugated rabbit anti-goat immunoglobulin (Atlantic Antibodies, Scarborough, ME, USA) for detection of IgA-containing cells; fluorescein isothiocyanate (FITC) conjugated goat anti-mouse IgM (μ-chain specific) (Cappel, Durham, NC, USA) for detection of IgM-containing cells; FITC-conjugated mouse monoclonal antibody against mouse IgG (γ-chain specific) (SeraLab); or FITC-conjugated mouse monoclonal antibody against mouse IgE (ε-chain specific) (SeraLab, Crawley Down, Sussex, UK). Following each 20 min incubation, excess reagent was removed and the slides rinsed in PBS. Finally slides were rinsed for 1 h in PBS and mounted in 90% glycerol in PBS. The number of Ig-containing cells in the intestine were counted under a 40× objective and 10× eyepieces using a Zeiss Axioskop 20 microscope with incident light illumination. Each section of the intestine was scanned from the tips of the villi to the base of the mucosa, and cells were counted in a total of 30 such scans. The average number of cells per scan was expressed as cells per linear cm of intestine by multiplying by 30.3, a correction factor determined from the field width of 330 mm, as previously described . Data has been tested for significance using Mann-Whitney test for non-parametric data. The results of this study have shown a recruitment of macrophages, neutrophils and eosinophils in the inflammatory lesions as well as an increase of immunoglobulin-producing cells in the 2.5% DSS-induced colitis and a decrease in more severe, 5%DSS-induced colitis. Detailed description of the DSS colitis induced with 2.5% and 5%DSS has previously been published [17, 18]. In healthy colonic mouse tissues, macrophage number was low and they were localized in the subepithelial region of lamina propria mucosae. Apart from a few positive cells, the submucosa was almost devoid of F4/80+ cells. After six days of continuous feeding with DSS their numbers increased, especially at the basis of crypts and in the submucosal layer. Further increase was seen after eight days of feeding with positive cells being uniformly distributed and not focally aggregated. Numerous macrophages were also found in the submucosa (Figure 1). Macrophage counts confirmed these findings as there was a significant difference in macrophage numbers in the inflamed colon at day eight of colitis compared to the control (p = 0.0002). (Figure 2). Findings were similar regardless whether 2.5% or 5%DSS was used. 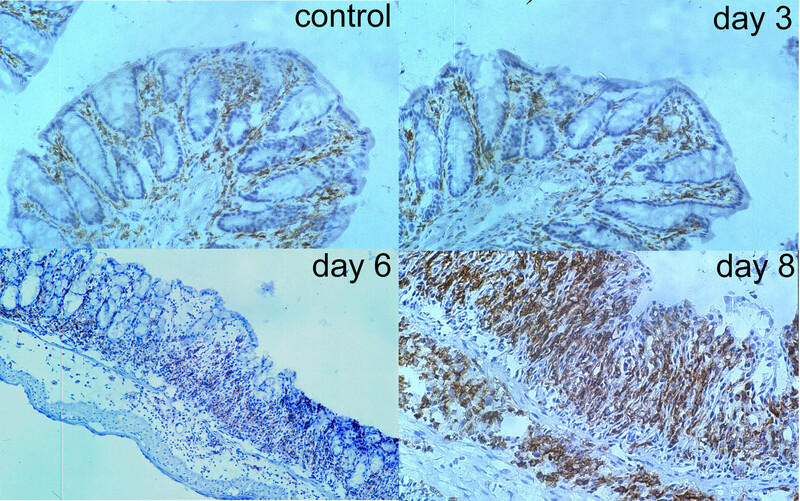 Immunohistochemical staining for macrophages with F4/80 antibody: Macrophages in healthy colonic mucosa (control) and at day 3 of DSS ingestion are localized predominantly in the lamina propria. Positive staining for macrophages in the submucosa was initially found at day 6 and increased at day 8 of DSS ingestion. 2.5% DSS-induced colitis. Findings from inflamed colons of 5%DSS-induced colitis were similar. Original magnification × 20. 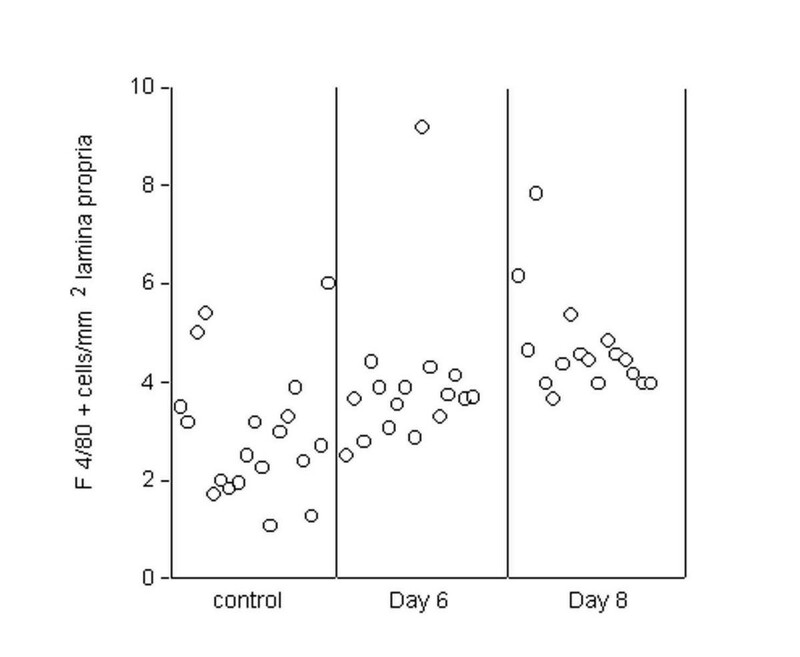 Numbers of macrophages (F4/80+ cells)/mm2 lamina propria in healthy tissue and at day 6 and 8 of DSS ingestion. ER-MP 20 is a monoclonal antibody that binds to single-chain glyco-proteins of 14 kD . The ER-MP 20 antigen is expressed at the monocyte stage of differentiation and disappears with further differentiation so it is not expressed on mature macrophages. We used the ER-MP 20 antibody to label recently recruited monocytes in the lesion and have found very few ER-MP 20+ cells in healthy tissue that were located mainly between crypts (Figure 3). After three days of feeding with DSS, ER-MP 20+ cells were found at the bases of crypts and between crypts but still in very low numbers. Numbers increased after six days of feeding: positive cells were located in the submucosa, between crypts and within the inflammatory infiltrate in the inflamed areas of the intestine and in the submucosa adjoining regions of ulceration after eight days of feeding with DSS. Unfortunately, the high background prevented an accurate count of positive cells. According to these results there is recruitment of peripheral blood monocytes into the lesion. 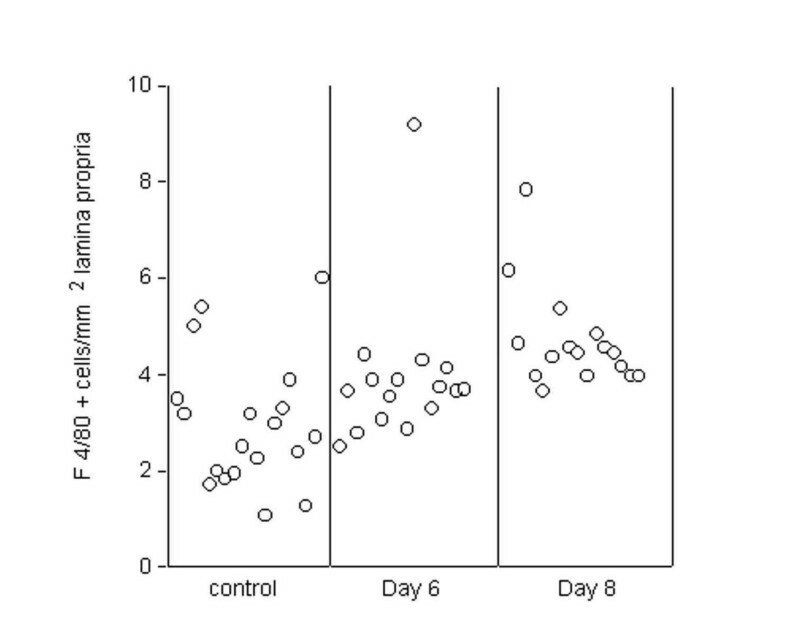 Recently recruited monocytes (labeled with ER-MP20 antibody) are scarce in healthy colonic tissue and greatly increased at day 8 of DSS ingestion. 2.5% DSS-induced colitis. Findings from inflamed colons of 5%DSS-induced colitis were similar. Original magnification × 20. By incubating macrophages with DSS and then using monoclonal anti-DSS antibody we were able to detect DSS within macrophages (data not shown) confirming that macrophages are able to phagocytose DSS. In addition, MHC Class II expression on macrophages increased in the inflamed tissue indicating that DSS may be processed and presented as an antigen. Aggregation of MHC Class II-positive cells was seen in lymphoid follicles. Epithelial cells of the inflamed colonic mucosa also expressed MHC Class II, a finding that was not observed in healthy tissue (Figure 4). MHC Class II expression (labelled with TIB 120) in healthy colonic tissue (control). Epithelial cells do not express this antigen. Expression is increased in inflamed colonic tissue at day 8 of DSS ingestion. Positive cells can also be found concentrated in the lymphoid follicle and there is expression on epithelial cells. 2.5% DSS-induced colitis. Findings from inflamed colons of 5%DSS-induced colitis were similar. Original magnification × 20. Staining for neutrophils was done by standard H&E staining followed by Giemsa stain to distinguish neutrophils from eosinophils and basophils and showed an increased numbers of neutrophils from day 6 of exposure to DSS. Similarly to findings by others , after 6–8 days of DSS feeding they could be found within crypts forming crypt abscesses, in the epithelial layer as well as in the lumen where ulceration occurred. Specific immunohistochemical staining and counting of neutrophils was not done in this study as it has been done by others. Their results showed an early infiltration with a small number of neutrophils from day 4 that occurred before arrival of any other inflammatory cell. In this study, crypt abscesses filled with aggregated neutrophils were also seen (unpublished data, personal communication with Dr. Andrzej Wozniak). In another study, selective depletion of neutrophils by a monoclonal antibody, RP-3, suppressed dextran sulphate sodium-induced colitis in rats . Eosinophil numbers are also increased in this model, but lower numbers of eosinophils in IL-5 deficient mice did not ameliorate the severity of the lesions . The presence and distribution of T cells in the inflammatory infiltrate during DSS-induced colitis was assessed by staining with anti-CD4 and anti-CD8 markers. Very few cells were CD8+ positive in the uninflamed colon; they were situated in the lamina propria or within the epithelial layer. 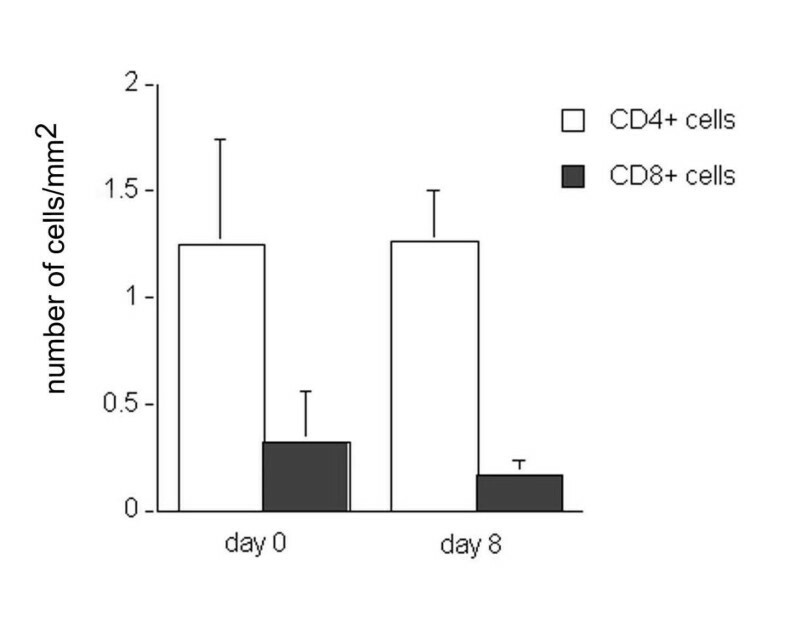 Even though numbers of CD4+ cells were higher than the numbers of CD8+ cells, both, CD4+ and CD8+ T cells numbers did not increase during the course of the colitis (Figure 5), indicating that these cells may not be playing an important role in the acute DSS-induced colitis. Numbers of CD4+ and CD8+ cells in healthy colonic lamina propria and in the inflamed colonic tissue at day 8 of 2.5%DSS ingestion. Findings from inflamed colons of 5%DSS-induced colitis were similar. An increase in plasma cell numbers in the inflammatory infiltrate of the 2.5% DSS-induced colitis was first demonstrated by methyl green pyronine staining. Further evidence for changes in immunoglobulin production and distribution was obtained by using immunofluorescent staining for immunoglobulin classes. 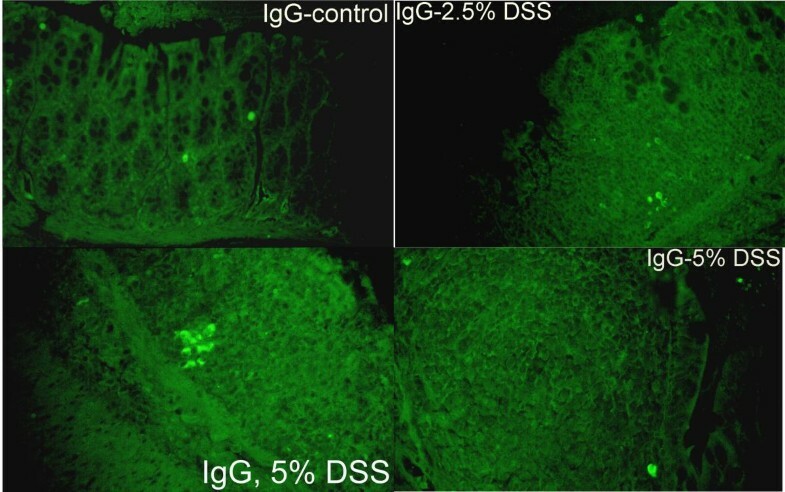 Total numbers of immunoglobulin-containing cells (IgG, IgA, IgM and IgE) (IgE+ cells were not detected in any sample) were decreased in specimens from mice in which colitis was induced by ingestion of 5% DSS and significantly increased in specimens from the 2.5% DSS-induced colitis (Fig. 6). Numbers of immunoglobulin-producing cells/cm intestine (top of image), IgA+ cells (a), IgG+ cells (b) and IgM+ cells (c) in healthy and inflamed colons at day 8 of 2.5% and 5% DSS ingestion. Many of the changes seen in the total immunoglobulin-producing cell population were due to changes in immunoglobulin A production. In the healthy mouse colon, IgA-producing cells were the predominant immunoglobulin-producing cells of the colon. These cells were found in the lamina propria of the mucosa, at the basis of crypts and directly below epithelial cells. Submucosa was devoid of IgA-producing cells. IgA could also be detected within the epithelial cells especially on the luminal side. Numbers of immunoglobulin A-producing cells significantly decreased during colitis induced by 5% DSS (p = 0.04). On the other hand, administration of 2.5% DSS induced an increase in IgA+ cells in colonic lamina propria and on the periphery of Payer's patches (Figure 7). 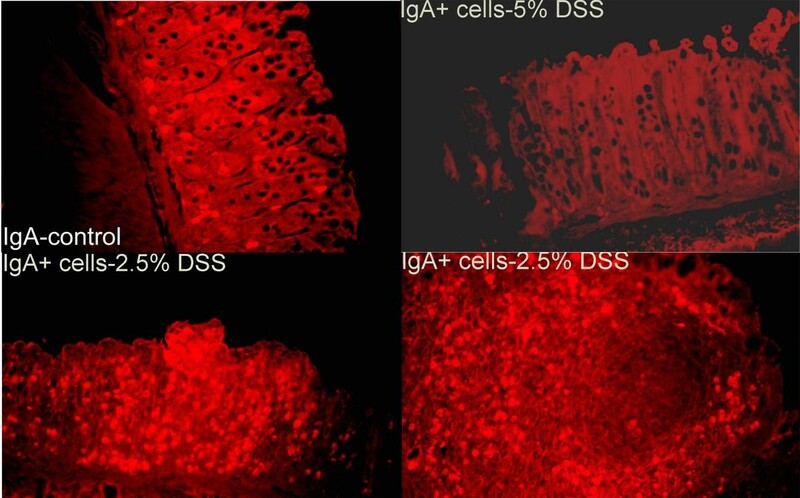 IgA-producing cells in healthy colonic tissue (control) and in inflamed colons at day 8 of 2.5% or 5% DSS ingestion. Numbers of IGA-producing cells were also increased at the outer layer of Payer's patches in colitis induced with 2.5% DSS (lower right). Original magnification × 20. 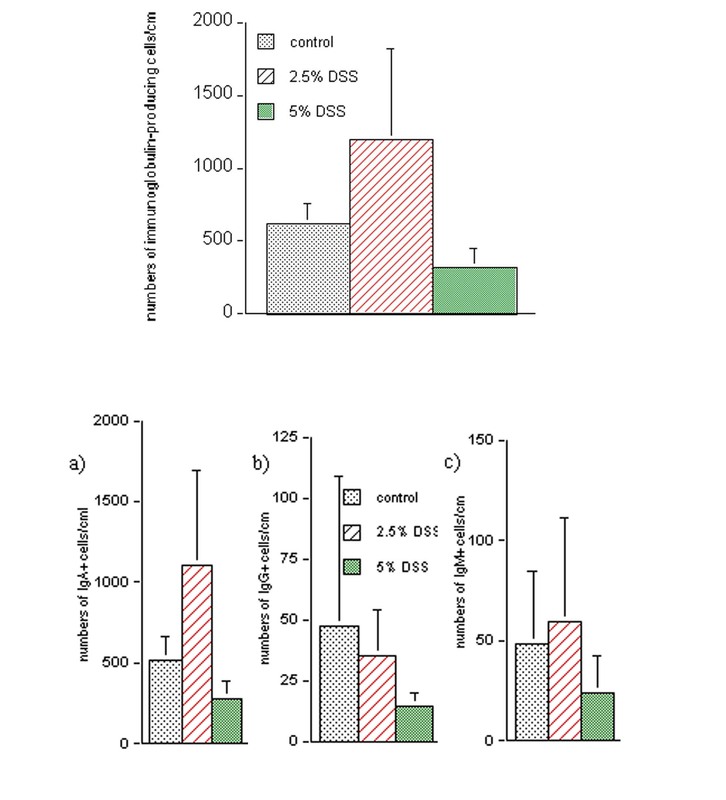 Colonic mucosa of healthy mice contained much less IgG-producing cells. As seen with igA-producing cells, Ig- producing cells were found in lamina propria mucosae between the crypts and below the epithelial cells. Immunoglobulin G cell numbers in the colonic mucosa did not change significantly in inflamed colons of mice exposed to either concentration of DSS (Figure 8). There were few IgG-producing cells located on the periphery of Payer's patches. Numbers of IgM-containing cells was slightly increased in specimens from the 2.5% DSS-induced colitis and decreased in tissue from 5% DSS-induced colitis (not up to a statistically significant level, p = 0.35) (data not shown). IgG-producing cells are scarce in healthy colonic tissue (control) and they are not more numerous on day 8 of the 2.5% or 5% DSS-induced colitis. Payer's patch contains few IgG positive cells located in the outer layer (lower right). Original magnification × 20. It has been shown that macrophages are present in the lamina propria of the mouse gastrointestinal tract . Our results confirmed these findings: F4/80+ cells in the colon of healthy mice were found mainly in the subepithelial region and between crypts. Numbers of macrophages (as labeled with F4/80) increased during the course of the colitis indicating their involvement in the inflammatory response. Macrophages were distributed uniformly throughout the lamina propria and submucosa. Their numbers increased from day 6 of exposure to DSS. As shown in the result section, staining with ER-MP 20 showed that a great number of macrophages in the inflammatory infiltrate are recently recruited peripheral blood monocytes. Staining using antibody directed against DSS revealed its presence within macrophages thus confirming the results of others [17, 27] obtained with toluidine blue staining. The underlying hypothesis as proposed by Ohikusa et al. is that dextran sulphate inhibits macrophage phagocytosis of bacteria and that this permits bacterial invasion into the mucosa. They showed that the phagocytic index of spleen macrophages from mice exposed to DSS for 7 days is decreased. However, while dextran sulphate does inhibit phagocytic activity of macrophages for the first 72 hours of administration, after that, stimulation occurs . MHC class II proteins play a central role in the presentation of antigens to T helper cells and their activation. It has been shown that expression of MHC class II antigen does not correlate directly with antigen presentation but bearing in mind the huge antigen load in the intestine, and given the observed epithelial expression of class II antigen in these experiments it can be speculated that antigen presentation and the subsequent immunological reactions do occur in colonic tissue. Whether the initial lesion occurs as a result of direct, nonspecific reactivity to DSS or not, specific immunological responses to DSS and the normal colonic flora may occur in the later stages of the disease. An assessment of neutrophil infiltration was done by a conventional H&E staining and in our material showed an increased numbers of neutrophils from day 6 of exposure to DSS. Specific immunohistochemical staining was not done in this study as it has been done by others. Their results showed an early infiltration with a small number of neutrophils from day 4 that occurred before arrival of any other inflammatory cell. Crypt abscesses filled with aggregated neutrophils were also seen (unpublished data, personal communication with Dr. Andrzej Wozniak), as they were demonstrated in this study with H&E staining. Assessment of T cell infiltration showed a decrease in numbers of CD8+ cells in the inflamed tissue while numbers of CD4+ cells were unchanged. Consequently the CD4/CD8 ratio was increased in specimens from day 8 of exposure to DSS (p = 0.04). The significance of this finding is unclear. It is clear, however, that T cells do not contribute significantly to the inflammatory infiltrate in the acute phase of the disease. Total numbers of immunoglobulin-containing cells were lower during the course of the acute colitis induced with 5% DSS, due to a decrease in numbers not only of IgA+ cells but also of IgG and IgM-containing cells. In contrast, numbers of immunoglobulin-containing cells in specimens from colons of mice in which colitis was induced with 2.5% DSS increased twofold. The increase was mainly in IgA-containing cells, while numbers of IgM-containing cells decreased significantly and numbers of IgG-containing cells did not change in the inflamed colon compared to healthy tissue. Comparison to the findings in human tissue from patients with IBD reveals some similarities, such as the increase of IgA-producing cells in patients with quiescent ulcerative colitis to the findings in DSS-colitis induced with 2.5% DSS . In contrast, the production of IgA in active ulcerative colitis lamina propria of the colon mononuclear cell cultures appeared to be significantly lower than that of both quiescent ulcerative colitis and controls in another study . The proportion of IgA-containing cells was lower in ileal tissue from patients with IBD in one study , a difference that was confirmed in another study but was shown not to be significant . Consequently, the 2.5% DSS-induced colitis could be used to study the behaviour of B cells in human quiescent colitis. The finding that IgG-containing cell numbers are unchanged is in contrast to the numerous studies which show a significant increase of IgG levels in human ulcerative colitis [9, 11, 12]. However, measuring the amount of secreted IgG, assessing IgG subclasses in the acute model and examining the changes in Ig-bearing cells in the chronic model may give results comparable to human IBD. Dextran sulphate has a direct effect on B cells by inducing their proliferation and differentiation via receptors that are different from the specific Ig receptors; this mitogenic response depends on the degree of sulphur substitution of DSS . However, the B cell population that is triggered by DSS consists mainly of relatively undifferentiated B cells, a population that may not be present in the colon. It may be that dextran sulphate sensitizes B cells to respond to LPS present in the lumen of the colon especially in the 2.5%DSS-induced colitis that is somewhat less severe. Experiments in vitro have shown that some B cell populations exposed to dextran sulphate show enhanced responsiveness to stimulation with LPS . Also, simultaneous addition of dextran sulphate and LPS to spleen-derived B cell cultures leads to a synergistic, T cell-independent polyclonal response by directly activating B cells . A study by Dieleman et al. in which DSS-colitis was induced in SCID mice sheds light on the importance of different inflammatory cells in the induction of injury in this model. SCID mice lack functional T cells and B cells but have an intact innate immune system i.e. macrophages, granulocytes and NK cells are healthy under specific pathogen-free conditions . Ingestion of DSS caused colitis in these mice therefore excluding the role of B and T lymphocytes in mediating the injury in this model. However, SCID mice were more susceptible to the disease indicating that either B or T cells may be protective in this colitis. The results of this study cannot completely exclude a possible role for the T cells as despite the lack of change in their numbers, their activation status may be affected by DSS. In this study, on the other hand, we have demonstrated changes of B cells population. Functional studies are needed to determine whether any of the two populations modifies the outcome of this colitis. The inflammatory infiltrate in the first 8 days of the dextran sulphate sodium-induced colitis consists predominantly of macrophages, neutrophils and eosinophils. Macrophage numbers increase during the acute stage of the colitis due to an increase of newly recruited monocytes. By incubating macrophages with DSS and than using monoclonal anti-DSS antibody we were able to detect DSS within macrophages confirming that macrophages are able to phagocytose DSS. In addition, MHC Class II expression on macrophages increased in the inflamed tissue indicating that DSS may be processed and presented as an antigen. Neutrophils are recruited very early into the lesion and were found within crypts forming crypt abscesses, in the lamina propria and at the basis of ulceration. While numbers of T cells do not change, total numbers of immunoglobulin-containing cells were decreased in specimens from mice in which colitis was induced by ingestion of 5% DSS and significantly increased in specimens from the 2.5% DSS-induced colitis. This was largely due to changes in IgA-producing cells that were the most affected at this stage of the inflammation.